The ZENITH DEFY EL PRIMERO 21 launched in 2017 heralded a new and fascinating chapter in time measurement, while the DEFY ZERO G continues writing the future of watchmaking in 2018 with its downsized and optimised gyroscopic “Gravity Control” model. After a first special edition presented in New York City last year, visionary musician and passionate watch-lover Swizz Beatz is once again honored by the issue of three new limited-edition DEFY models. In keeping with ZENITH’s 150-year tradition, the innovative El Primero 21 was designed specifically for precision and reliability. It follows a line of legends such as the El Primero, the first chronograph with an integrated automatic column-wheel mechanism, which enabled timing to 1/10th of a second. The El Primero has represented a milestone in watchmaking up to the present day. Since 2017, the 21st-century El Primero has been opening up the world of 1/100th of a second timing and impressively combining the historic heritage of ZENITH with the future of watchmaking. In doing so, the ZENITH DEFY EL PRIMERO 21 represents a new benchmark in the construction of mechanical watches. The impressive calibre has a frequency of 360,000 VpH (50 Hz) – ten times higher than its legendary predecessor – which enables ultra-precise timekeeping. 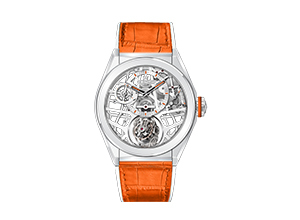 This technical stroke of genius makes a striking appearance on the dial. The central seconds hand circles the dial once every second and enables us to experience the visual wonder of these measured hundredth of a second fractions. The new and innovative design of the movement also provides significantly better performance with a considerably lower number of components. Meanwhile, 2018 witnesses the release of the DEFY ZERO G, offering a futuristic reinterpretation of ZENITH’s patented “Gravity Control” module, which cancels out the effects of gravity on the running rate of the watch, by maintaining the regulating organ and the balance wheel in a horizontal position. The gyroscopic cage – inspired by historical marine chronometers – which previously spun between two convex sapphire crystals, now occupies only 30% of its initial volume and can thus fit perfectly between the two flat sapphire crystals of the DEFY case. This technical, feather-light device appears in all its majesty at 6 o’clock. 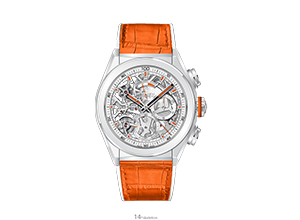 The new DEFY Grand Complication model exudes a modern, stylised design. Visible on both sides, its entirely skeletonised and black rhodium-treated movement makes a striking contrast with the light tone of the five slim branches evoking the offset ZENITH star symbol. Known for his eclectic and discerning style choices and his mature appreciation of watchmaking, Swizz Beatz had already welcomed the December 2017 NYC launch of a DEFY EL PRIMERO 21 six-piece Edition Unique that attracted considerable interest among watch connoisseurs and music-lovers. Aficionados are now being treated to three colorful and appealing new special editions.